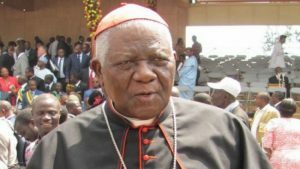 Christian Cardinal Tumi, one of the lead conveners of the third edition of the All Anglophone Conference, billed for November in Buea, has doused off threats from the Mayor of Buea, Patrick Ekema who had vowed that the said conference would not take place in his municipality. Reacting to the threats from Mayor Ekema, Cardinal Tumi maintained that Ekema has no competence and wouldn’t be able to disturb the holding of AACIII. At a recent planning meeting aimed at preparing for the said meeting, a budget of over FCFA 32 million was made for the event scheduled to hold on November 21 and 22 in Buea. The information was revealed on Thursday October 11, 2018 in Douala during a press conference organised by the conveners of the AACIII. The money according to the organisers will come from the general public. The conference is expected to be attended by invited persons at home and abroad, who can all play a vital part toward resolving the prolonged crisis and bring the much needed peace to the people of former West Cameroons and Cameroon at large. Cardinal Tumi’s pronouncement that Mayor Ekema does not have the competence to perturb the holding of the conference was made in response to threats issued by the said Mayor, who has promised to disrupt such a gathering. Mayor Ekema had made the threats during a timidly attended meeting which he said was that of Bakweri Sons and Daughter. The meeting took place in August of 2018. During the meeting, Mayor Ekema said the conference will not hold in Buea even if the Head of State, Paul Biya approves of it. The AACIII had originally been planned for September and was later on postponed by the organisers who said it was best holding it after the October 7 Presidential elections. The Conference according to the Religious Leaders, who dominate the Organising Committee, will propose long lasting solutions to the Anglophone crisis that has been rocking the two English speaking Regions of Cameroon since 2016. The organisers comprise of different Leaders of various religious denominations in Cameroon, mainly Roman Catholic, Presbyterian Church in Cameroon, PCC, and the Islam. One of the organisers is Dr Simon Munzu who has a similar experience from his work at the UN, he took part as a key actor in AACII, which was aimed at stemming the same problem. The conference will be coming after a series of meetings to solve the crisis by the Government had not yielded any fruits. The conference grasped the attention of the international community, during the UN Human Right Commission general assembly last month. The New Commissioner, Michelle Bachelett, while slamming the Cameroon military and restoration fighters over gross violation of Human rights in the deepening Anglophone crisis, accused the government of Cameroon saying it has not done enough to promote the conference planned by the religious leaders. I simply want to tell you that I’m all new to blogs and honestly savored your web site. Probably I’m going to bookmark your website . You actually have tremendous article content. Thanks for revealing your web-site. The great fresh articles keep me coming here time and time again. thanks again so much. Where did you get your information from? A ot of it is true but I would like to check on a couple of things. Good day, I just hopped over in your web site via StumbleUpon. Not something I would generally read, but I favored your emotions none the less. Thank you for making something value reading. cakevjqhekb,A fascinating discussion is definitely worth comment. I do think that you ought to publish more on this topic, it may not be a taboo khrworcg,subject but generally folks don’t talk about such subjects. To the next! All the best!! jyiwgsi,Hi there, just wanted to say, I liked this article. It was helpful. Keep on posting! I actually wanted to develop a note to be able to express gratitude to you for all of the fabulous concepts you are showing on this website. My time-consuming internet investigation has at the end been rewarded with professional facts and techniques to write about with my friends and family. I ‘d say that we readers are really fortunate to live in a very good website with so many lovely individuals with helpful concepts. I feel somewhat grateful to have used the web pages and look forward to really more enjoyable moments reading here. Thank you again for all the details. I do trust all of the ideas you have offered for your post. They’re very convincing and can certainly work. Still, the posts are very brief for newbies. May you please lengthen them a bit from next time? Thank you for the post. I’m still learning from you, as I’m trying to reach my goals. I definitely love reading all that is written on your blog.Keep the posts coming. I enjoyed it! Great goods from you, man. I have understand your stuff previous to and you are just extremely excellent. I really like what you’ve acquired here, really like what you are stating and the way in which you say it. You make it entertaining and you still care for to keep it smart. I cant wait to read much more from you. This is really a terrific website. Whats Happening i’m new to this, I stumbled upon this I have discovered It positively useful and it has helped me out loads. I am hoping to contribute & aid different users like its aided me. Great job. Good ¡V I should definitely pronounce, impressed with your web site. I had no trouble navigating through all tabs as well as related info ended up being truly easy to do to access. I recently found what I hoped for before you know it in the least. Quite unusual. Is likely to appreciate it for those who add forums or something, website theme . a tones way for your client to communicate. Excellent task.. Simply desire to say your article is as amazing. The clearness in your post is simply great and i can assume you’re an expert on this subject. Well with your permission let me to grab your RSS feed to keep up to date with forthcoming post. Thanks a million and please carry on the rewarding work. Magnificent website. Lots of useful information here. I¡¦m sending it to several buddies ans additionally sharing in delicious. And certainly, thank you to your sweat! Its like you read my mind! You appear to know a lot about this, like you wrote the book in it or something. I think that you could do with some pics to drive the message home a bit, but other than that, this is fantastic blog. An excellent read. I will certainly be back. I wanted to put you a little bit of remark to say thanks once again for those superb principles you have provided at this time. It has been simply unbelievably generous of people like you in giving easily exactly what a few individuals could possibly have advertised for an ebook to make some bucks for their own end, particularly considering the fact that you could have tried it in case you considered necessary. Those ideas likewise acted like a great way to realize that some people have the identical interest like mine to know a great deal more pertaining to this matter. Certainly there are thousands of more fun moments ahead for many who start reading your blog. Thank you for any other excellent article. Where else could anybody get that type of info in such an ideal approach of writing? I have a presentation subsequent week, and I am at the search for such information. I will immediately grasp your rss as I can not to find your e-mail subscription link or newsletter service. Do you’ve any? Kindly allow me realize in order that I could subscribe. Thanks. You really make it appear so easy with your presentation but I in finding this topic to be actually something which I believe I would never understand. It sort of feels too complicated and extremely broad for me. I’m having a look ahead to your next post, I will attempt to get the grasp of it! Thank you a lot for providing individuals with an extraordinarily terrific chance to read from here. It can be so pleasurable and also jam-packed with fun for me personally and my office peers to visit the blog at least three times in a week to see the fresh tips you have got. And lastly, I am certainly contented concerning the stunning tips and hints you serve. Selected 1 tips in this post are definitely the most beneficial we have had. Thanks for sharing excellent informations. Your web site is very cool. I am impressed by the details that you¡¦ve on this blog. It reveals how nicely you understand this subject. Bookmarked this web page, will come back for extra articles. You, my friend, ROCK! I found just the information I already searched all over the place and just couldn’t come across. What an ideal web-site. Hello, Neat post. There’s an issue together with your website in web explorer, might test this¡K IE still is the market leader and a good component to folks will pass over your magnificent writing due to this problem. A few things i have seen in terms of laptop memory is there are specifications such as SDRAM, DDR and so on, that must match the specifications of the motherboard. If the personal computer’s motherboard is rather current while there are no main system issues, upgrading the memory literally normally takes under one hour. It’s among the list of easiest computer upgrade treatments one can picture. Thanks for giving your ideas. I will immediately grab your rss as I can not to find your e-mail subscription hyperlink or newsletter service. Do you have any? Kindly allow me recognise in order that I could subscribe. Thanks. Well I really enjoyed reading it. This post provided by you is very practical for good planning. I just want to say I am new to blogging and site-building and absolutely savored this blog site. Most likely I’m want to bookmark your site . You really come with tremendous articles and reviews. Thanks for sharing with us your webpage. I am also writing to make you know what a really good experience my friend’s child enjoyed reading your web site. She even learned so many pieces, including what it’s like to have an excellent giving mindset to let other individuals with no trouble know chosen hard to do subject matter. You actually surpassed visitors’ expectations. Many thanks for providing the beneficial, trusted, educational and also unique thoughts on this topic to Janet. I am also commenting to let you be aware of of the helpful discovery my wife’s princess found studying your web site. She picked up numerous details, which include what it’s like to have a very effective coaching spirit to make others with ease fully grasp chosen complicated topics. You truly exceeded visitors’ expected results. Thank you for displaying those insightful, trustworthy, explanatory and cool guidance on your topic to Julie. hello!,I love your writing very a lot! percentage we be in contact extra approximately your article on AOL? I need a specialist in this space to unravel my problem. May be that is you! Taking a look forward to look you. I was just searching for this information for a while. After 6 hours of continuous Googleing, at last I got it in your site. I wonder what is the lack of Google strategy that don’t rank this type of informative websites in top of the list. Normally the top web sites are full of garbage. Good ¡V I should definitely pronounce, impressed with your web site. I had no trouble navigating through all the tabs and related information ended up being truly easy to do to access. I recently found what I hoped for before you know it in the least. Reasonably unusual. Is likely to appreciate it for those who add forums or anything, site theme . a tones way for your customer to communicate. Excellent task..
hey there and thank you for your info – I have definitely picked up something new from right here. I did however expertise several technical points using this website, since I experienced to reload the website a lot of times previous to I could get it to load correctly. I had been wondering if your web host is OK? Not that I’m complaining, but sluggish loading instances times will often affect your placement in google and could damage your high quality score if advertising and marketing with Adwords. Well I am adding this RSS to my e-mail and could look out for much more of your respective interesting content. Ensure that you update this again soon..
hello!,I like your writing very much! percentage we keep up a correspondence extra approximately your post on AOL? I need an expert in this area to unravel my problem. Maybe that’s you! Taking a look forward to peer you. I have read some excellent stuff here. Definitely price bookmarking for revisiting. I wonder how much effort you set to make any such great informative site. Thanks for any other informative web site. The place else could I get that kind of info written in such a perfect way? I have a challenge that I’m simply now running on, and I have been at the look out for such information. I would like to thnkx for the efforts you’ve put in writing this web site. I’m hoping the same high-grade blog post from you in the upcoming also. In fact your creative writing skills has encouraged me to get my own site now. Actually the blogging is spreading its wings fast. Your write up is a good example of it. It’s appropriate time to make some plans for the future and it’s time to be happy. I have read this post and if I could I desire to suggest you few interesting things or suggestions. Maybe you can write next articles referring to this article. I want to read more things about it! Good ¡V I should definitely pronounce, impressed with your website. I had no trouble navigating through all the tabs and related info ended up being truly easy to do to access. I recently found what I hoped for before you know it at all. Reasonably unusual. Is likely to appreciate it for those who add forums or anything, web site theme . a tones way for your client to communicate. Excellent task.. I actually wanted to type a simple remark to express gratitude to you for these fantastic hints you are writing at this website. My considerable internet lookup has at the end of the day been honored with reliable strategies to exchange with my close friends. I ‘d believe that many of us site visitors actually are extremely lucky to dwell in a useful network with so many perfect professionals with good tactics. I feel rather blessed to have come across your entire website page and look forward to tons of more thrilling minutes reading here. Thank you once again for everything. My spouse and i ended up being quite fortunate that Raymond could finish up his inquiry from the precious recommendations he was given from your own web pages. It’s not at all simplistic to just happen to be offering secrets which some people may have been making money from. Therefore we do know we have the writer to give thanks to for that. The most important illustrations you have made, the simple blog navigation, the relationships you will give support to engender – it’s got many sensational, and it is letting our son and us reason why that situation is entertaining, which is certainly quite important. Thanks for everything! Needed to compose you that tiny note to help thank you very much as before for your fantastic techniques you’ve contributed at this time. It’s certainly pretty open-handed of you to give extensively all most of us could have advertised as an electronic book to generate some cash for their own end, primarily seeing that you could possibly have done it in case you wanted. Those things as well acted like the fantastic way to be sure that other people online have the identical desire the same as my very own to know a good deal more with regard to this matter. I know there are numerous more fun situations ahead for people who check out your website. I have to convey my respect for your kind-heartedness supporting men who need help with your subject matter. Your very own commitment to passing the solution along had been remarkably interesting and has truly enabled some individuals just like me to attain their dreams. Your useful help and advice denotes this much a person like me and much more to my office workers. Thanks a lot; from all of us. Excellent post. I was checking continuously this blog and I am impressed! Extremely helpful info specifically the last part 🙂 I care for such information a lot. I was looking for this particular information for a very long time. Thank you and good luck. I cling on to listening to the news lecture about receiving free online grant applications so I have been looking around for the top site to get one. Could you advise me please, where could i get some? Hello there. I discovered your website via Google at the same time as searching for a comparable subject, your site came up. It looks good. I’ve bookmarked it in my google bookmarks to come back then. Hiya, I am really glad I’ve found this info. Today bloggers publish just about gossip and internet stuff and this is actually irritating. A good site with exciting content, that is what I need. Thanks for making this site, and I’ll be visiting again. Do you do newsletters by email? Hiya, I am really glad I’ve found this info. Nowadays bloggers publish only about gossip and net stuff and this is actually frustrating. A good blog with interesting content, that is what I need. Thanks for making this web site, and I will be visiting again. Do you do newsletters by email? Thank you a lot for providing individuals with an extremely superb opportunity to read from this blog. It really is very useful plus packed with fun for me and my office mates to search the blog more than three times weekly to find out the fresh items you will have. And indeed, we’re at all times fascinated concerning the wonderful inspiring ideas you serve. Certain 3 ideas in this post are really the finest we have ever had. I would like to thank you for the efforts you’ve put in writing this site. I’m hoping the same high-grade website post from you in the upcoming as well. In fact your creative writing abilities has encouraged me to get my own web site now. Actually the blogging is spreading its wings quickly. Your write up is a great example of it. Thanks for any other informative website. Where else may I am getting that type of info written in such an ideal manner? I have a undertaking that I’m simply now running on, and I have been at the look out for such information. Hiya, I’m really glad I’ve found this info. Today bloggers publish only about gossip and net stuff and this is really annoying. A good site with interesting content, that is what I need. Thank you for making this website, and I will be visiting again. Do you do newsletters by email? Hello my loved one! I wish to say that this post is awesome, nice written and include almost all vital infos. I¡¦d like to see more posts like this . Great remarkable issues here. I¡¦m very satisfied to see your post. Thanks a lot and i am having a look forward to touch you. Will you kindly drop me a e-mail? excellent put up, very informative. I ponder why the opposite experts of this sector do not notice this. You should proceed your writing. I am confident, you have a great readers’ base already! Hi there, I discovered your blog by means of Google even as searching for a comparable subject, your site got here up, it seems good. I’ve bookmarked it in my google bookmarks. I have read a few just right stuff here. Certainly price bookmarking for revisiting. I wonder how much attempt you set to create this sort of magnificent informative website. Hey there. I discovered your website via Google whilst searching for a comparable topic, your web site came up. It appears good. I’ve bookmarked it in my google bookmarks to come back then. Hey there. I found your blog by the use of Google even as searching for a comparable subject, your website came up. It appears to be good. I’ve bookmarked it in my google bookmarks to visit then. Hello there. I discovered your website by way of Google even as searching for a related matter, your website came up. It appears to be great. I’ve bookmarked it in my google bookmarks to come back then. fantastic put up, very informative. I ponder why the other experts of this sector don’t understand this. You must continue your writing. I’m confident, you have a great readers’ base already! wonderful points altogether, you simply received a new reader. What might you suggest in regards to your publish that you just made a few days ago? Any certain? You can definitely see your enthusiasm within the work you write. The sector hopes for even more passionate writers like you who are not afraid to mention how they believe. All the time follow your heart. Hiya, I’m really glad I’ve found this information. Today bloggers publish only about gossip and net stuff and this is really annoying. A good site with interesting content, that is what I need. Thanks for making this web site, and I’ll be visiting again. Do you do newsletters by email? Hiya, I am really glad I have found this information. Today bloggers publish just about gossip and web stuff and this is actually frustrating. A good website with exciting content, that is what I need. Thank you for making this website, and I’ll be visiting again. Do you do newsletters by email? Great remarkable issues here. I¡¦m very satisfied to look your article. Thank you so much and i am looking ahead to contact you. Will you kindly drop me a mail? I would like to voice my love for your kind-heartedness in support of those individuals that really want guidance on the content. Your personal commitment to getting the solution around was exceptionally informative and has truly enabled many people just like me to get to their desired goals. Your amazing invaluable hints and tips can mean so much to me and even further to my office colleagues. Thanks a ton; from everyone of us. Hiya, I am really glad I’ve found this information. Nowadays bloggers publish just about gossip and internet stuff and this is actually irritating. A good blog with exciting content, this is what I need. Thank you for making this website, and I will be visiting again. Do you do newsletters by email? Hi there. I found your website by means of Google even as looking for a comparable matter, your website got here up. It appears great. I have bookmarked it in my google bookmarks to visit then. Hiya, I’m really glad I have found this information. Nowadays bloggers publish only about gossip and net stuff and this is really frustrating. A good web site with exciting content, this is what I need. Thank you for making this web site, and I will be visiting again. Do you do newsletters by email? I have been surfing online more than three hours today, yet I never found any interesting article like yours. It’s pretty worth enough for me. In my view, if all webmasters and bloggers made good content as you did, the internet will be a lot more useful than ever before. Hiya, I am really glad I’ve found this information. Today bloggers publish only about gossip and internet stuff and this is really frustrating. A good website with exciting content, this is what I need. Thank you for making this website, and I will be visiting again. Do you do newsletters by email? What i do not realize is actually how you’re now not actually much more smartly-liked than you might be now. You are so intelligent. You know thus considerably relating to this matter, produced me individually consider it from so many varied angles. Its like men and women don’t seem to be involved until it is something to do with Lady gaga! Your personal stuffs outstanding. Always handle it up! I¡¦ve been exploring for a little bit for any high-quality articles or weblog posts on this sort of house . Exploring in Yahoo I ultimately stumbled upon this website. Reading this info So i am satisfied to express that I have a very good uncanny feeling I found out exactly what I needed. I so much definitely will make sure to don¡¦t put out of your mind this website and give it a glance regularly. whoah this weblog is excellent i like studying your posts. Stay up the great work! You recognize, a lot of persons are searching round for this info, you could aid them greatly. There is evidently a bunch to know about this. I feel you made various good points in features also. Hello there. I found your site by the use of Google even as looking for a comparable topic, your web site got here up. It seems to be good. I’ve bookmarked it in my google bookmarks to come back then. Hiya, I’m really glad I’ve found this info. Today bloggers publish just about gossip and web stuff and this is actually irritating. A good web site with interesting content, this is what I need. Thanks for making this website, and I will be visiting again. Do you do newsletters by email? Hiya, I am really glad I have found this info. Today bloggers publish just about gossip and internet stuff and this is actually irritating. A good site with exciting content, that is what I need. Thank you for making this website, and I will be visiting again. Do you do newsletters by email? Wow! This can be one particular of the most helpful blogs We’ve ever arrive across on this subject. Actually Wonderful. I’m also an expert in this topic therefore I can understand your hard work. I’m still learning from you, while I’m trying to achieve my goals. I definitely liked reading everything that is written on your website.Keep the tips coming. I liked it! Excellent web site. A lot of useful information here. I¡¦m sending it to some friends ans also sharing in delicious. And naturally, thanks in your effort! I’ve been browsing online more than 3 hours today, yet I never found any interesting article like yours. It’s pretty worth enough for me. In my view, if all web owners and bloggers made good content as you did, the internet will be a lot more useful than ever before. Hiya, I am really glad I have found this information. Today bloggers publish only about gossip and web stuff and this is really irritating. A good blog with exciting content, this is what I need. Thank you for making this site, and I’ll be visiting again. Do you do newsletters by email? Hey there. I discovered your site by way of Google while looking for a comparable matter, your web site came up. It looks good. I have bookmarked it in my google bookmarks to come back then. Hiya, I am really glad I’ve found this info. Nowadays bloggers publish just about gossip and internet stuff and this is actually frustrating. A good web site with interesting content, that’s what I need. Thank you for making this website, and I’ll be visiting again. Do you do newsletters by email? I simply wished to say thanks yet again. I do not know what I might have gone through without the actual ideas revealed by you over my subject matter. It was a terrifying circumstance in my position, but taking a look at this expert form you resolved that forced me to weep for contentment. Now i am thankful for your help as well as hope you comprehend what a great job that you are doing teaching the rest all through a site. Probably you haven’t got to know any of us. Its like you read my mind! You appear to know so much about this, like you wrote the book in it or something. I think that you could do with some pics to drive the message home a bit, but instead of that, this is excellent blog. An excellent read. I’ll definitely be back. Good ¡V I should certainly pronounce, impressed with your web site. I had no trouble navigating through all tabs and related info ended up being truly easy to do to access. I recently found what I hoped for before you know it at all. Reasonably unusual. Is likely to appreciate it for those who add forums or anything, website theme . a tones way for your client to communicate. Excellent task..
Hey there. I found your website via Google even as searching for a related matter, your website came up. It seems to be good. I have bookmarked it in my google bookmarks to visit then. Thank you, I have recently been looking for info approximately this topic for a long time and yours is the best I’ve found out so far. But, what in regards to the conclusion? Are you sure concerning the supply? Hiya, I am really glad I’ve found this info. Nowadays bloggers publish only about gossip and web stuff and this is actually irritating. A good website with exciting content, this is what I need. Thank you for making this web-site, and I’ll be visiting again. Do you do newsletters by email? Hey there. I found your site by way of Google even as searching for a similar matter, your site got here up. It seems to be good. I have bookmarked it in my google bookmarks to come back then. Hiya, I’m really glad I have found this info. Today bloggers publish just about gossip and net stuff and this is really frustrating. A good blog with exciting content, that is what I need. Thanks for making this web site, and I’ll be visiting again. Do you do newsletters by email? Hiya, I am really glad I have found this info. Nowadays bloggers publish just about gossip and net stuff and this is actually irritating. A good blog with interesting content, that’s what I need. Thanks for making this web-site, and I will be visiting again. Do you do newsletters by email? Hello there. I discovered your site by the use of Google even as looking for a comparable matter, your web site came up. It looks great. I have bookmarked it in my google bookmarks to visit then. Hello there. I discovered your blog via Google whilst looking for a comparable matter, your web site came up. It appears to be good. I have bookmarked it in my google bookmarks to come back then. Hiya, I am really glad I have found this information. Today bloggers publish just about gossip and internet stuff and this is really frustrating. A good website with interesting content, this is what I need. Thanks for making this website, and I’ll be visiting again. Do you do newsletters by email? Hiya, I’m really glad I’ve found this information. Today bloggers publish just about gossip and web stuff and this is really annoying. A good web site with interesting content, that is what I need. Thank you for making this web site, and I’ll be visiting again. Do you do newsletters by email? Hiya, I am really glad I’ve found this information. Nowadays bloggers publish only about gossip and web stuff and this is really irritating. A good website with exciting content, this is what I need. Thank you for making this web-site, and I will be visiting again. Do you do newsletters by email? Whats Taking place i’m new to this, I stumbled upon this I have found It positively useful and it has aided me out loads. I’m hoping to contribute & aid different users like its aided me. Great job. You actually make it seem so easy together with your presentation however I find this matter to be really something which I feel I’d never understand. It seems too complicated and very large for me. I am having a look forward to your next submit, I will try to get the cling of it! I as well as my buddies appeared to be checking out the nice tips located on your site while then I got a terrible feeling I had not expressed respect to the website owner for those strategies. My ladies are actually as a result thrilled to read through all of them and have in effect definitely been making the most of these things. We appreciate you turning out to be really accommodating and also for settling on such essential topics most people are really eager to learn about. Our sincere apologies for not expressing gratitude to you earlier. Hi there. I found your web site via Google even as searching for a similar subject, your site got here up. It seems to be good. I’ve bookmarked it in my google bookmarks to visit then. Hey there. I discovered your website by means of Google whilst looking for a similar topic, your site came up. It looks great. I have bookmarked it in my google bookmarks to come back then. Hiya, I am really glad I have found this information. Today bloggers publish just about gossip and web stuff and this is actually irritating. A good blog with exciting content, that is what I need. Thanks for making this site, and I will be visiting again. Do you do newsletters by email? Hey there. I found your site by the use of Google even as searching for a related subject, your web site got here up. It seems great. I have bookmarked it in my google bookmarks to come back then. Hello there. I discovered your web site via Google even as searching for a similar topic, your website came up. It appears to be good. I have bookmarked it in my google bookmarks to visit then. Hiya, I’m really glad I have found this information. Nowadays bloggers publish just about gossip and internet stuff and this is actually irritating. A good site with exciting content, this is what I need. Thanks for making this website, and I’ll be visiting again. Do you do newsletters by email? Hiya, I’m really glad I have found this info. Today bloggers publish only about gossip and web stuff and this is actually annoying. A good site with interesting content, this is what I need. Thanks for making this site, and I will be visiting again. Do you do newsletters by email? Hey very nice web site!! Man .. Beautiful .. Amazing .. I’ll bookmark your site and take the feeds additionally¡KI’m glad to seek out so many helpful information here within the publish, we’d like work out extra techniques on this regard, thank you for sharing. . . . . .
Whats Happening i’m new to this, I stumbled upon this I’ve discovered It absolutely helpful and it has aided me out loads. I am hoping to give a contribution & assist different customers like its helped me. Good job. Wonderful goods from you, man. I have understand your stuff previous to and you’re just too magnificent. I really like what you’ve acquired here, certainly like what you’re saying and the way in which you say it. You make it entertaining and you still take care of to keep it wise. I can’t wait to read much more from you. This is really a great site. Hiya, I am really glad I’ve found this info. Nowadays bloggers publish only about gossip and web stuff and this is actually frustrating. A good blog with exciting content, that’s what I need. Thanks for making this web site, and I’ll be visiting again. Do you do newsletters by email? Hiya, I’m really glad I’ve found this information. Today bloggers publish only about gossip and net stuff and this is really annoying. A good web site with interesting content, this is what I need. Thank you for making this website, and I’ll be visiting again. Do you do newsletters by email? Hello there. I found your blog by way of Google while looking for a similar topic, your website got here up. It appears good. I’ve bookmarked it in my google bookmarks to visit then. Hiya, I am really glad I’ve found this info. Today bloggers publish just about gossip and internet stuff and this is really irritating. A good web site with exciting content, this is what I need. Thanks for making this web site, and I will be visiting again. Do you do newsletters by email? Hiya, I’m really glad I’ve found this information. Today bloggers publish only about gossip and internet stuff and this is really irritating. A good website with exciting content, this is what I need. Thanks for making this web site, and I will be visiting again. Do you do newsletters by email? Thanks for some other informative web site. The place else could I get that kind of information written in such a perfect means? I have a challenge that I am just now working on, and I’ve been on the glance out for such information. Hey there. I discovered your website by the use of Google while looking for a similar subject, your web site got here up. It seems great. I have bookmarked it in my google bookmarks to come back then. It¡¦s actually a cool and useful piece of information. I¡¦m happy that you shared this useful info with us. Please stay us informed like this. Thank you for sharing. Hey there. I discovered your web site via Google while looking for a related topic, your site got here up. It appears to be good. I have bookmarked it in my google bookmarks to visit then. Hello there. I found your blog via Google even as looking for a similar subject, your web site came up. It looks good. I have bookmarked it in my google bookmarks to visit then. Hey there. I found your blog via Google even as looking for a comparable topic, your site got here up. It seems to be great. I’ve bookmarked it in my google bookmarks to visit then. Hi there. I discovered your website by way of Google even as looking for a related topic, your website got here up. It seems great. I’ve bookmarked it in my google bookmarks to visit then. Hiya, I am really glad I have found this info. Today bloggers publish only about gossip and internet stuff and this is actually irritating. A good site with exciting content, that’s what I need. Thanks for making this website, and I’ll be visiting again. Do you do newsletters by email? Hey there. I discovered your web site by way of Google while searching for a similar subject, your website got here up. It seems to be good. I’ve bookmarked it in my google bookmarks to come back then. Hiya, I’m really glad I have found this information. Today bloggers publish only about gossip and web stuff and this is actually irritating. A good website with exciting content, this is what I need. Thank you for making this web site, and I’ll be visiting again. Do you do newsletters by email? Hi there. I discovered your blog by way of Google at the same time as looking for a related matter, your web site got here up. It looks great. I’ve bookmarked it in my google bookmarks to visit then. Hiya, I’m really glad I have found this info. Today bloggers publish just about gossip and net stuff and this is really annoying. A good website with interesting content, this is what I need. Thank you for making this web site, and I’ll be visiting again. Do you do newsletters by email? Nice post. I was checking continuously this blog and I’m impressed! Very useful information specially the last part 🙂 I care for such info a lot. I was seeking this certain information for a very long time. Thank you and best of luck. Hiya, I’m really glad I have found this info. Today bloggers publish just about gossip and internet stuff and this is actually annoying. A good web site with interesting content, that is what I need. Thanks for making this site, and I’ll be visiting again. Do you do newsletters by email? Hiya, I am really glad I have found this information. Nowadays bloggers publish just about gossip and internet stuff and this is actually annoying. A good web site with interesting content, that is what I need. Thank you for making this web site, and I will be visiting again. Do you do newsletters by email? Hey there. I found your site via Google at the same time as searching for a similar subject, your website got here up. It appears good. I’ve bookmarked it in my google bookmarks to come back then. Hello there. I found your website via Google at the same time as searching for a comparable topic, your website got here up. It appears great. I have bookmarked it in my google bookmarks to visit then. Hiya, I am really glad I’ve found this information. Nowadays bloggers publish only about gossip and web stuff and this is really frustrating. A good site with exciting content, that is what I need. Thank you for making this web-site, and I will be visiting again. Do you do newsletters by email? Hiya, I am really glad I’ve found this info. Nowadays bloggers publish only about gossip and net stuff and this is really annoying. A good site with interesting content, that’s what I need. Thank you for making this site, and I will be visiting again. Do you do newsletters by email? Hello there. I found your web site by the use of Google while looking for a similar matter, your site came up. It looks great. I’ve bookmarked it in my google bookmarks to come back then. Hi my loved one! I want to say that this post is awesome, great written and include almost all important infos. I¡¦d like to look more posts like this . Hello, i think that i saw you visited my web site so i came to “return the favor”.I am attempting to find things to enhance my site!I suppose its ok to use a few of your ideas!! Hiya, I am really glad I have found this information. Today bloggers publish just about gossip and internet stuff and this is actually irritating. A good blog with exciting content, this is what I need. Thanks for making this website, and I will be visiting again. Do you do newsletters by email? Hiya, I am really glad I’ve found this information. Nowadays bloggers publish only about gossip and internet stuff and this is actually irritating. A good website with exciting content, this is what I need. Thank you for making this site, and I’ll be visiting again. Do you do newsletters by email? Hey there. I found your web site via Google at the same time as searching for a related topic, your website came up. It seems great. I’ve bookmarked it in my google bookmarks to come back then. Hi there. I discovered your website via Google whilst searching for a comparable matter, your site came up. It appears to be great. I’ve bookmarked it in my google bookmarks to come back then. Hiya, I’m really glad I have found this information. Today bloggers publish just about gossip and web stuff and this is actually irritating. A good website with interesting content, this is what I need. Thanks for making this web site, and I’ll be visiting again. Do you do newsletters by email? Hiya, I am really glad I’ve found this info. Today bloggers publish only about gossip and net stuff and this is really frustrating. A good site with exciting content, this is what I need. Thanks for making this website, and I’ll be visiting again. Do you do newsletters by email? Hello there. I discovered your web site by way of Google at the same time as looking for a similar subject, your web site came up. It looks good. I’ve bookmarked it in my google bookmarks to visit then. Hiya, I’m really glad I have found this info. Nowadays bloggers publish only about gossip and web stuff and this is actually annoying. A good web site with interesting content, this is what I need. Thank you for making this website, and I’ll be visiting again. Do you do newsletters by email? There is apparently a bunch to know about this. I assume you made various nice points in features also. It¡¦s really a great and useful piece of info. I am glad that you just shared this useful information with us. Please stay us up to date like this. Thanks for sharing. It¡¦s in point of fact a great and helpful piece of information. I am happy that you just shared this useful info with us. Please keep us up to date like this. Thank you for sharing. Great amazing issues here. I¡¦m very glad to see your article. Thank you a lot and i’m taking a look ahead to contact you. Will you please drop me a e-mail? Oh my goodness! Amazing article dude! Thanks, However I am encountering troubles with your RSS. I don’t understand the reason why I cannot subscribe to it. Is there anybody else having similar RSS issues? Anyone who knows the answer can you kindly respond? Thanks!! Just wish to say your article is as astounding. The clearness in your post is just nice and i could assume you’re an expert on this subject. Well with your permission let me to grab your RSS feed to keep up to date with forthcoming post. Thanks a million and please keep up the gratifying work. Wow, amazing weblog layout! How lengthy have you been running a blog for? you made blogging look easy. The entire glance of your web site is great, as well as the content! hello!,I like your writing so so much! percentage we keep up a correspondence extra about your post on AOL? I need an expert in this area to unravel my problem. May be that’s you! Taking a look forward to look you. I¡¦ve learn several excellent stuff here. Certainly worth bookmarking for revisiting. I surprise how a lot attempt you put to create such a magnificent informative site. Hiya, I am really glad I have found this information. Today bloggers publish just about gossip and web stuff and this is actually annoying. A good web site with exciting content, that is what I need. Thanks for making this web site, and I’ll be visiting again. Do you do newsletters by email? Hiya, I’m really glad I have found this information. Nowadays bloggers publish just about gossip and web stuff and this is really irritating. A good website with interesting content, this is what I need. Thanks for making this web site, and I will be visiting again. Do you do newsletters by email? Hello there. I found your site via Google while looking for a comparable subject, your website got here up. It appears good. I’ve bookmarked it in my google bookmarks to come back then. Hiya, I’m really glad I have found this info. Nowadays bloggers publish only about gossip and internet stuff and this is actually frustrating. A good blog with interesting content, this is what I need. Thanks for making this site, and I’ll be visiting again. Do you do newsletters by email? Hello there. I discovered your website by way of Google while looking for a related matter, your site came up. It appears to be great. I have bookmarked it in my google bookmarks to visit then. Hiya, I am really glad I have found this info. Nowadays bloggers publish just about gossip and net stuff and this is actually annoying. A good web site with interesting content, this is what I need. Thanks for making this website, and I will be visiting again. Do you do newsletters by email? I was just looking for this information for some time. After 6 hours of continuous Googleing, at last I got it in your site. I wonder what is the lack of Google strategy that do not rank this type of informative web sites in top of the list. Usually the top websites are full of garbage. Hiya, I am really glad I have found this information. Today bloggers publish only about gossip and net stuff and this is really irritating. A good website with interesting content, this is what I need. Thanks for making this website, and I’ll be visiting again. Do you do newsletters by email? Hi there. I found your website via Google while looking for a related subject, your web site got here up. It seems to be good. I’ve bookmarked it in my google bookmarks to visit then. Hiya, I’m really glad I have found this information. Today bloggers publish only about gossip and web stuff and this is actually annoying. A good web site with exciting content, that is what I need. Thank you for making this website, and I’ll be visiting again. Do you do newsletters by email? Hiya, I’m really glad I have found this info. Today bloggers publish only about gossip and net stuff and this is actually annoying. A good web site with exciting content, this is what I need. Thanks for making this web-site, and I will be visiting again. Do you do newsletters by email? Hey there. I discovered your site by means of Google even as looking for a related subject, your site got here up. It seems good. I’ve bookmarked it in my google bookmarks to visit then. Hiya, I’m really glad I have found this information. Today bloggers publish just about gossip and net stuff and this is really irritating. A good web site with exciting content, that is what I need. Thank you for making this website, and I will be visiting again. Do you do newsletters by email? Hiya, I am really glad I have found this info. Today bloggers publish only about gossip and internet stuff and this is really annoying. A good website with exciting content, this is what I need. Thanks for making this website, and I’ll be visiting again. Do you do newsletters by email? Hiya, I am really glad I’ve found this information. Nowadays bloggers publish only about gossip and web stuff and this is actually irritating. A good website with exciting content, this is what I need. Thank you for making this site, and I’ll be visiting again. Do you do newsletters by email? Hiya, I’m really glad I have found this information. Nowadays bloggers publish only about gossip and web stuff and this is really frustrating. A good site with interesting content, this is what I need. Thank you for making this website, and I will be visiting again. Do you do newsletters by email? Hiya, I am really glad I have found this info. Nowadays bloggers publish only about gossip and net stuff and this is really annoying. A good blog with exciting content, this is what I need. Thank you for making this web-site, and I will be visiting again. Do you do newsletters by email? Hello there. I discovered your site via Google at the same time as searching for a related matter, your website came up. It looks good. I’ve bookmarked it in my google bookmarks to come back then. Hi there. I discovered your blog by the use of Google whilst searching for a related matter, your web site came up. It looks great. I have bookmarked it in my google bookmarks to come back then. Hello there. I found your blog by means of Google at the same time as looking for a comparable matter, your web site came up. It looks good. I’ve bookmarked it in my google bookmarks to come back then. Hello there. I discovered your blog by way of Google whilst looking for a comparable matter, your website came up. It looks great. I’ve bookmarked it in my google bookmarks to visit then. What i do not realize is in truth how you are no longer really much more neatly-liked than you may be now. You’re so intelligent. You know therefore significantly in the case of this matter, produced me personally believe it from a lot of varied angles. Its like men and women are not involved except it is something to do with Lady gaga! Your personal stuffs excellent. Always deal with it up! It¡¦s really a cool and helpful piece of info. I¡¦m satisfied that you shared this helpful info with us. Please keep us informed like this. Thanks for sharing. hello!,I like your writing very so much! share we communicate extra about your post on AOL? I need a specialist in this space to resolve my problem. Maybe that’s you! Looking ahead to see you. Hey there. I discovered your web site by the use of Google while searching for a comparable subject, your site came up. It seems to be great. I’ve bookmarked it in my google bookmarks to visit then. Hi there. I found your site by way of Google whilst searching for a comparable subject, your web site got here up. It appears to be great. I have bookmarked it in my google bookmarks to visit then. Hi there. I found your site by the use of Google while searching for a similar matter, your web site got here up. It appears good. I’ve bookmarked it in my google bookmarks to come back then. Hello there. I discovered your website via Google while searching for a related matter, your website got here up. It looks good. I’ve bookmarked it in my google bookmarks to visit then. Hey there. I discovered your site via Google at the same time as looking for a similar topic, your site came up. It looks good. I have bookmarked it in my google bookmarks to come back then. Hello there. I discovered your site by means of Google even as looking for a similar matter, your web site came up. It seems good. I’ve bookmarked it in my google bookmarks to visit then. Hello there. I discovered your site by the use of Google while searching for a comparable matter, your website came up. It looks great. I have bookmarked it in my google bookmarks to visit then. Hiya, I am really glad I have found this info. Nowadays bloggers publish only about gossip and net stuff and this is really frustrating. A good blog with exciting content, that is what I need. Thank you for making this web-site, and I will be visiting again. Do you do newsletters by email? Hiya, I am really glad I have found this information. Nowadays bloggers publish only about gossip and net stuff and this is actually annoying. A good site with exciting content, that is what I need. Thank you for making this web site, and I’ll be visiting again. Do you do newsletters by email? Hiya, I’m really glad I have found this information. Today bloggers publish only about gossip and net stuff and this is really frustrating. A good site with interesting content, this is what I need. Thanks for making this website, and I’ll be visiting again. Do you do newsletters by email? Hiya, I am really glad I’ve found this information. Today bloggers publish just about gossip and net stuff and this is actually annoying. A good site with exciting content, that is what I need. Thank you for making this website, and I will be visiting again. Do you do newsletters by email? Hi there. I found your website by means of Google whilst searching for a similar matter, your web site got here up. It seems to be great. I have bookmarked it in my google bookmarks to visit then. Hi there. I found your web site via Google even as searching for a similar topic, your site came up. It looks great. I’ve bookmarked it in my google bookmarks to visit then. Hi there. I discovered your site by means of Google while searching for a comparable matter, your site came up. It seems to be good. I have bookmarked it in my google bookmarks to visit then. Hi there. I found your site by way of Google even as looking for a related subject, your site got here up. It seems to be good. I’ve bookmarked it in my google bookmarks to visit then. Hello there. I found your web site via Google at the same time as searching for a similar matter, your website came up. It appears good. I have bookmarked it in my google bookmarks to come back then. Hiya, I am really glad I have found this information. Nowadays bloggers publish only about gossip and net stuff and this is really frustrating. A good web site with exciting content, that’s what I need. Thanks for making this web-site, and I will be visiting again. Do you do newsletters by email? Hiya, I am really glad I have found this information. Nowadays bloggers publish only about gossip and web stuff and this is actually frustrating. A good website with exciting content, this is what I need. Thanks for making this website, and I will be visiting again. Do you do newsletters by email? Hey there. I found your site via Google even as looking for a related matter, your website got here up. It appears to be great. I’ve bookmarked it in my google bookmarks to visit then. Hello there. I found your blog by the use of Google at the same time as looking for a related subject, your website came up. It seems to be great. I’ve bookmarked it in my google bookmarks to come back then. Hiya, I’m really glad I have found this information. Nowadays bloggers publish just about gossip and net stuff and this is really irritating. A good site with exciting content, that’s what I need. Thank you for making this site, and I’ll be visiting again. Do you do newsletters by email? Hiya, I’m really glad I have found this info. Today bloggers publish just about gossip and web stuff and this is actually annoying. A good web site with exciting content, that’s what I need. Thanks for making this web site, and I’ll be visiting again. Do you do newsletters by email? Hiya, I’m really glad I’ve found this info. Nowadays bloggers publish just about gossip and web stuff and this is actually annoying. A good blog with interesting content, that is what I need. Thank you for making this web site, and I will be visiting again. Do you do newsletters by email? Hiya, I’m really glad I have found this info. Nowadays bloggers publish only about gossip and internet stuff and this is actually irritating. A good blog with exciting content, that is what I need. Thanks for making this web site, and I’ll be visiting again. Do you do newsletters by email? Hiya, I am really glad I’ve found this information. Today bloggers publish just about gossip and web stuff and this is really annoying. A good site with exciting content, this is what I need. Thank you for making this website, and I’ll be visiting again. Do you do newsletters by email? Hiya, I am really glad I have found this info. Today bloggers publish only about gossip and net stuff and this is actually irritating. A good web site with exciting content, that is what I need. Thank you for making this site, and I will be visiting again. Do you do newsletters by email? Hey there. I found your website by way of Google even as searching for a related subject, your web site got here up. It seems to be good. I have bookmarked it in my google bookmarks to visit then. Great post. I was checking continuously this blog and I am impressed! Very useful information particularly the last part 🙂 I care for such information much. I was seeking this certain info for a long time. Thank you and best of luck. Hey there. I found your web site by way of Google even as looking for a similar topic, your site came up. It appears good. I’ve bookmarked it in my google bookmarks to visit then. Hiya, I’m really glad I’ve found this information. Nowadays bloggers publish only about gossip and web stuff and this is really irritating. A good web site with interesting content, this is what I need. Thanks for making this website, and I’ll be visiting again. Do you do newsletters by email? Hiya, I’m really glad I’ve found this info. Nowadays bloggers publish just about gossip and net stuff and this is really frustrating. A good web site with interesting content, this is what I need. Thanks for making this web site, and I will be visiting again. Do you do newsletters by email? Hey there. I discovered your website by means of Google even as searching for a related subject, your web site came up. It looks great. I have bookmarked it in my google bookmarks to come back then. Hi there. I found your web site by means of Google whilst looking for a similar subject, your web site got here up. It seems to be great. I have bookmarked it in my google bookmarks to come back then. Hey there. I found your web site via Google even as searching for a related subject, your site came up. It seems good. I have bookmarked it in my google bookmarks to come back then. My husband and i ended up being fulfilled Louis could conclude his investigations through the precious recommendations he got through the blog. It’s not at all simplistic to simply always be giving for free tips and hints that many some other people have been trying to sell. We fully understand we need you to appreciate for that. The type of explanations you made, the easy site menu, the relationships you will aid to create – it’s got most impressive, and it’s really leading our son and the family imagine that that content is thrilling, which is quite vital. Thank you for the whole lot! Hiya, I’m really glad I’ve found this information. Nowadays bloggers publish just about gossip and web stuff and this is actually annoying. A good website with exciting content, this is what I need. Thank you for making this site, and I will be visiting again. Do you do newsletters by email? Hello there. I found your blog by way of Google at the same time as looking for a similar topic, your site came up. It appears to be good. I have bookmarked it in my google bookmarks to visit then. Hiya, I am really glad I’ve found this info. Today bloggers publish just about gossip and net stuff and this is really annoying. A good web site with interesting content, this is what I need. Thank you for making this web site, and I will be visiting again. Do you do newsletters by email? Hi there. I found your website via Google even as looking for a comparable matter, your website came up. It seems good. I’ve bookmarked it in my google bookmarks to visit then. Hey there. I found your website by means of Google while looking for a related topic, your web site got here up. It looks good. I have bookmarked it in my google bookmarks to visit then. Hi there. I discovered your web site via Google whilst searching for a comparable subject, your website got here up. It seems to be great. I’ve bookmarked it in my google bookmarks to visit then. Hey there. I discovered your blog via Google while searching for a similar topic, your site came up. It looks great. I have bookmarked it in my google bookmarks to come back then. Hi there. I discovered your website via Google while searching for a related subject, your website came up. It looks good. I have bookmarked it in my google bookmarks to visit then. Hiya, I am really glad I’ve found this info. Today bloggers publish just about gossip and web stuff and this is really irritating. A good website with exciting content, this is what I need. Thanks for making this website, and I will be visiting again. Do you do newsletters by email? Hiya, I’m really glad I’ve found this information. Today bloggers publish just about gossip and net stuff and this is actually annoying. A good website with interesting content, this is what I need. Thanks for making this website, and I’ll be visiting again. Do you do newsletters by email? Hiya, I’m really glad I have found this info. Today bloggers publish only about gossip and internet stuff and this is actually annoying. A good website with exciting content, this is what I need. Thank you for making this website, and I’ll be visiting again. Do you do newsletters by email? Hello there. I discovered your site by way of Google while searching for a related subject, your website came up. It seems to be great. I have bookmarked it in my google bookmarks to come back then. Hiya, I am really glad I have found this information. Today bloggers publish only about gossip and internet stuff and this is actually annoying. A good web site with exciting content, this is what I need. Thanks for making this web-site, and I will be visiting again. Do you do newsletters by email? Hiya, I’m really glad I’ve found this info. Today bloggers publish only about gossip and web stuff and this is actually irritating. A good blog with interesting content, this is what I need. Thank you for making this site, and I’ll be visiting again. Do you do newsletters by email? Hiya, I am really glad I have found this information. Nowadays bloggers publish only about gossip and internet stuff and this is really annoying. A good blog with exciting content, that’s what I need. Thank you for making this web-site, and I will be visiting again. Do you do newsletters by email? Hiya, I am really glad I have found this information. Nowadays bloggers publish only about gossip and net stuff and this is really frustrating. A good website with interesting content, that is what I need. Thanks for making this site, and I will be visiting again. Do you do newsletters by email? Hiya, I am really glad I have found this info. Nowadays bloggers publish only about gossip and net stuff and this is actually frustrating. A good web site with exciting content, that’s what I need. Thank you for making this web-site, and I’ll be visiting again. Do you do newsletters by email? Hiya, I’m really glad I have found this info. Nowadays bloggers publish just about gossip and web stuff and this is actually frustrating. A good web site with exciting content, this is what I need. Thank you for making this web-site, and I’ll be visiting again. Do you do newsletters by email? Hiya, I’m really glad I’ve found this information. Nowadays bloggers publish just about gossip and internet stuff and this is actually irritating. A good site with exciting content, that is what I need. Thanks for making this site, and I’ll be visiting again. Do you do newsletters by email? Hey there. I found your website by way of Google even as looking for a similar matter, your website came up. It appears to be good. I have bookmarked it in my google bookmarks to visit then. Hello there. I discovered your website via Google whilst searching for a related matter, your website got here up. It seems to be great. I have bookmarked it in my google bookmarks to come back then. An interesting discussion is worth comment. I do think that you need to publish more on this subject matter, it might not be a taboo matter but usually folks don’t discuss such issues. To the next! Kind regards!! Hey there. I found your website by means of Google whilst looking for a similar subject, your website got here up. It looks good. I’ve bookmarked it in my google bookmarks to come back then. Hello there. I discovered your site by way of Google at the same time as searching for a similar subject, your website got here up. It appears to be good. I have bookmarked it in my google bookmarks to come back then. Hiya, I’m really glad I’ve found this information. Today bloggers publish only about gossip and web stuff and this is really frustrating. A good blog with exciting content, that is what I need. Thanks for making this site, and I’ll be visiting again. Do you do newsletters by email? Hiya, I am really glad I have found this information. Nowadays bloggers publish only about gossip and web stuff and this is actually irritating. A good site with exciting content, this is what I need. Thanks for making this site, and I’ll be visiting again. Do you do newsletters by email? Hiya, I am really glad I’ve found this info. Nowadays bloggers publish only about gossip and internet stuff and this is really irritating. A good site with interesting content, this is what I need. Thanks for making this site, and I’ll be visiting again. Do you do newsletters by email? Hello there. I found your site by the use of Google whilst looking for a comparable subject, your web site got here up. It appears to be great. I’ve bookmarked it in my google bookmarks to visit then. Hello there. I discovered your site by the use of Google whilst looking for a comparable subject, your website got here up. It looks great. I’ve bookmarked it in my google bookmarks to visit then. Hello there. I found your web site via Google even as searching for a comparable matter, your web site got here up. It seems to be great. I have bookmarked it in my google bookmarks to visit then. Hey there. I found your blog in the shape of Google whilst trying to find a related subject, your site got here up. It appears great. I’ve bookmarked it in my google bookmarks ahead back then. Hiya, I am really glad I’ve found this information. Today bloggers publish only about gossip and web stuff and this is really frustrating. A good site with interesting content, that is what I need. Thank you for making this site, and I will be visiting again. Do you do newsletters by email? Hey there. I discovered your blog by means of Google at the same time as searching for a comparable matter, your web site came up. It appears to be great. I have bookmarked it in my google bookmarks to come back then. Hi there. I found your blog by means of Google even as looking for a related topic, your web site got here up. It seems great. I have bookmarked it in my google bookmarks to come back then. Hiya, I am really glad I’ve found this info. Today bloggers publish just about gossip and web stuff and this is really frustrating. A good web site with interesting content, that is what I need. Thank you for making this web-site, and I will be visiting again. Do you do newsletters by email? Hiya, I’m really glad I’ve found this information. Today bloggers publish only about gossip and web stuff and this is really frustrating. A good website with exciting content, this is what I need. Thank you for making this web site, and I’ll be visiting again. Do you do newsletters by email? like this blog. He was once entirely right. This publish actually made my day. Hello there. I discovered your blog via Google while searching for a related topic, your website got here up. It appears great. I’ve bookmarked it in my google bookmarks to visit then. Hello there. I discovered your website by the use of Google at the same time as searching for a similar topic, your website got here up. It seems to be great. I have bookmarked it in my google bookmarks to come back then. Hiya, I’m really glad I’ve found this info. Today bloggers publish only about gossip and net stuff and this is really annoying. A good site with exciting content, that’s what I need. Thanks for making this web site, and I will be visiting again. Do you do newsletters by email? Hey there. I found your site by the use of Google at the same time as looking for a similar matter, your website came up. It looks good. I’ve bookmarked it in my google bookmarks to come back then. Hello there. I found your website by means of Google while looking for a similar topic, your website came up. It looks great. I’ve bookmarked it in my google bookmarks to visit then. Hiya, I am really glad I’ve found this information. Today bloggers publish only about gossip and web stuff and this is really frustrating. A good website with exciting content, that’s what I need. Thank you for making this site, and I’ll be visiting again. Do you do newsletters by email? Hello there. I found your web site by way of Google whilst searching for a similar subject, your web site came up. It appears good. I’ve bookmarked it in my google bookmarks to visit then. Hey there. I found your website by way of Google whilst looking for a similar topic, your website came up. It appears to be great. I’ve bookmarked it in my google bookmarks to visit then. Hello there. I discovered your blog by means of Google even as looking for a related topic, your site got here up. It seems good. I’ve bookmarked it in my google bookmarks to visit then. Hiya, I’m really glad I’ve found this info. Today bloggers publish just about gossip and internet stuff and this is actually frustrating. A good website with exciting content, this is what I need. Thanks for making this web-site, and I will be visiting again. Do you do newsletters by email? Hiya, I am really glad I have found this information. Nowadays bloggers publish just about gossip and web stuff and this is really irritating. A good website with interesting content, this is what I need. Thanks for making this web site, and I’ll be visiting again. Do you do newsletters by email? Hi there. I found your website by the use of Google even as looking for a related topic, your site came up. It seems to be great. I have bookmarked it in my google bookmarks to visit then. Hey there. I found your web site by way of Google at the same time as looking for a comparable topic, your site got here up. It looks great. I have bookmarked it in my google bookmarks to come back then. Hiya, I am really glad I have found this info. Nowadays bloggers publish just about gossip and internet stuff and this is actually frustrating. A good website with exciting content, this is what I need. Thank you for making this web-site, and I’ll be visiting again. Do you do newsletters by email? Hello there. I found your blog via Google whilst searching for a similar topic, your website got here up. It appears great. I have bookmarked it in my google bookmarks to visit then. Hiya, I’m really glad I’ve found this info. Today bloggers publish just about gossip and internet stuff and this is really annoying. A good website with interesting content, that’s what I need. Thank you for making this web site, and I’ll be visiting again. Do you do newsletters by email? Hi there. I discovered your website by way of Google even as looking for a similar subject, your site got here up. It appears to be great. I’ve bookmarked it in my google bookmarks to visit then. Hiya, I’m really glad I have found this information. Nowadays bloggers publish just about gossip and net stuff and this is really irritating. A good web site with exciting content, this is what I need. Thank you for making this web site, and I’ll be visiting again. Do you do newsletters by email? Hiya, I’m really glad I’ve found this information. Nowadays bloggers publish only about gossip and internet stuff and this is actually frustrating. A good web site with exciting content, that is what I need. Thank you for making this web-site, and I will be visiting again. Do you do newsletters by email? Hiya, I’m really glad I’ve found this information. Nowadays bloggers publish just about gossip and net stuff and this is actually irritating. A good web site with interesting content, that is what I need. Thanks for making this web-site, and I’ll be visiting again. Do you do newsletters by email? Hiya, I’m really glad I have found this information. Today bloggers publish just about gossip and internet stuff and this is actually annoying. A good site with interesting content, this is what I need. Thanks for making this web-site, and I will be visiting again. Do you do newsletters by email? Hiya, I’m really glad I have found this info. Nowadays bloggers publish just about gossip and internet stuff and this is actually irritating. A good blog with exciting content, that’s what I need. Thank you for making this site, and I will be visiting again. Do you do newsletters by email? Thank you for every other informative website. The place else could I get that kind of info written in such a perfect way? I’ve a undertaking that I’m simply now operating on, and I’ve been at the glance out for such info. hey there and thank you for your info – I have definitely picked up something new from right here. I did however expertise a few technical points using this site, since I experienced to reload the web site many times previous to I could get it to load properly. I had been wondering if your web host is OK? Not that I am complaining, but sluggish loading instances times will very frequently affect your placement in google and could damage your high quality score if ads and marketing with Adwords. Anyway I am adding this RSS to my e-mail and can look out for a lot more of your respective interesting content. Ensure that you update this again soon..
Hiya, I am really glad I’ve found this information. Today bloggers publish only about gossip and net stuff and this is really irritating. A good site with exciting content, this is what I need. Thank you for making this web-site, and I will be visiting again. Do you do newsletters by email? Hey there. I found your website by way of Google even as looking for a related topic, your website got here up. It seems to be good. I have bookmarked it in my google bookmarks to visit then. Hiya, I am really glad I’ve found this information. Today bloggers publish just about gossip and web stuff and this is really annoying. A good site with exciting content, that is what I need. Thanks for making this web site, and I’ll be visiting again. Do you do newsletters by email? Hi there. I discovered your web site via Google while looking for a comparable subject, your web site came up. It looks great. I’ve bookmarked it in my google bookmarks to come back then. Hello there. I found your website via Google at the same time as looking for a comparable subject, your website came up. It looks great. I have bookmarked it in my google bookmarks to visit then. Hiya, I am really glad I’ve found this info. Nowadays bloggers publish only about gossip and net stuff and this is really annoying. A good web site with exciting content, that is what I need. Thank you for making this web site, and I will be visiting again. Do you do newsletters by email? Hiya, I’m really glad I have found this information. Nowadays bloggers publish just about gossip and net stuff and this is really irritating. A good blog with interesting content, this is what I need. Thanks for making this web-site, and I will be visiting again. Do you do newsletters by email? Hiya, I’m really glad I’ve found this information. Today bloggers publish only about gossip and net stuff and this is really irritating. A good web site with interesting content, this is what I need. Thanks for making this site, and I will be visiting again. Do you do newsletters by email? Hello there. I discovered your website by the use of Google while searching for a related matter, your site got here up. It seems great. I’ve bookmarked it in my google bookmarks to come back then. Hiya, I’m really glad I’ve found this information. Today bloggers publish only about gossip and web stuff and this is actually irritating. A good website with exciting content, that is what I need. Thank you for making this web site, and I’ll be visiting again. Do you do newsletters by email? Hello there. I discovered your website by means of Google even as searching for a similar subject, your site got here up. It seems to be great. I’ve bookmarked it in my google bookmarks to visit then. Hello there. I found your web site by the use of Google whilst looking for a related topic, your website came up. It seems to be great. I have bookmarked it in my google bookmarks to visit then. Hello there. I found your blog by way of Google at the same time as looking for a similar topic, your site came up. It seems to be good. I have bookmarked it in my google bookmarks to come back then. Hey there. I discovered your website by the use of Google at the same time as searching for a similar matter, your site came up. It looks good. I have bookmarked it in my google bookmarks to come back then. looks fine but when opening in I.E., it’s got some overlapping issues. I simply wanted to provide you with a quick heads up! Other than that, excellent blog! Hiya, I am really glad I’ve found this info. Nowadays bloggers publish only about gossip and internet stuff and this is really annoying. A good web site with exciting content, that is what I need. Thank you for making this website, and I’ll be visiting again. Do you do newsletters by email? Hi there. I found your site by way of Google even as searching for a similar matter, your web site came up. It seems good. I have bookmarked it in my google bookmarks to come back then. Hiya, I am really glad I have found this info. Today bloggers publish just about gossip and web stuff and this is actually annoying. A good website with interesting content, this is what I need. Thanks for making this site, and I will be visiting again. Do you do newsletters by email? Hiya, I am really glad I’ve found this information. Today bloggers publish just about gossip and net stuff and this is actually irritating. A good blog with exciting content, that’s what I need. Thanks for making this website, and I’ll be visiting again. Do you do newsletters by email? Hi there. I found your blog by way of Google at the same time as searching for a similar topic, your site came up. It seems good. I have bookmarked it in my google bookmarks to come back then. Hiya, I am really glad I have found this info. Nowadays bloggers publish only about gossip and web stuff and this is really frustrating. A good blog with interesting content, that’s what I need. Thanks for making this website, and I’ll be visiting again. Do you do newsletters by email? Hiya, I’m really glad I’ve found this info. Today bloggers publish just about gossip and web stuff and this is really irritating. A good site with interesting content, that’s what I need. Thanks for making this site, and I’ll be visiting again. Do you do newsletters by email? Hiya, I am really glad I have found this info. Nowadays bloggers publish only about gossip and web stuff and this is actually annoying. A good web site with exciting content, this is what I need. Thanks for making this web-site, and I’ll be visiting again. Do you do newsletters by email? Hiya, I’m really glad I have found this info. Today bloggers publish just about gossip and net stuff and this is really frustrating. A good website with interesting content, this is what I need. Thank you for making this web-site, and I will be visiting again. Do you do newsletters by email? I will right away seize your rss as I can’t find your email subscription hyperlink or newsletter service. Do you have any? Please permit me know in order that I could subscribe. Thanks. Hiya, I am really glad I’ve found this info. Today bloggers publish only about gossip and net stuff and this is really annoying. A good site with exciting content, this is what I need. Thank you for making this web site, and I will be visiting again. Do you do newsletters by email? Hiya, I am really glad I have found this info. Today bloggers publish only about gossip and web stuff and this is really annoying. A good blog with exciting content, this is what I need. Thank you for making this web site, and I’ll be visiting again. Do you do newsletters by email? Hey there. I discovered your site via Google while looking for a comparable matter, your web site got here up. It seems great. I’ve bookmarked it in my google bookmarks to visit then. Hiya, I’m really glad I have found this info. Today bloggers publish only about gossip and net stuff and this is really irritating. A good blog with exciting content, that is what I need. Thank you for making this web site, and I’ll be visiting again. Do you do newsletters by email? Hello there. I discovered your website by means of Google even as searching for a similar topic, your site got here up. It appears to be great. I have bookmarked it in my google bookmarks to come back then. Hi there. I found your blog by the use of Google whilst looking for a similar subject, your web site got here up. It looks great. I have bookmarked it in my google bookmarks to come back then. Hello there. I found your website by means of Google even as looking for a related subject, your web site got here up. It appears great. I’ve bookmarked it in my google bookmarks to come back then. Hello there. I found your web site by the use of Google even as looking for a similar topic, your web site got here up. It seems great. I’ve bookmarked it in my google bookmarks to come back then. Hiya, I’m really glad I’ve found this info. Nowadays bloggers publish only about gossip and net stuff and this is actually frustrating. A good blog with exciting content, this is what I need. Thanks for making this website, and I will be visiting again. Do you do newsletters by email? Hiya, I’m really glad I’ve found this information. Today bloggers publish only about gossip and net stuff and this is actually frustrating. A good website with interesting content, this is what I need. Thank you for making this web-site, and I will be visiting again. Do you do newsletters by email? Hiya, I’m really glad I’ve found this information. Today bloggers publish just about gossip and net stuff and this is actually irritating. A good blog with interesting content, this is what I need. Thank you for making this web site, and I’ll be visiting again. Do you do newsletters by email? Hello there. I discovered your web site by the use of Google at the same time as looking for a comparable subject, your web site came up. It seems to be great. I have bookmarked it in my google bookmarks to visit then. Hey there. I discovered your blog by means of Google at the same time as looking for a related matter, your website got here up. It seems good. I have bookmarked it in my google bookmarks to visit then.